Sometimes people think that as a Kindergarten teacher you are talking quietly and gently because the children are young and perhaps a little uncertain about coming to school. Of course we want them to feel welcomed, comfortable and loved. Embedded in every word we say is a statement, a declaration, an intention about expectations. Having taught many grades over the years, we bring with us the experience and the knowledge that clearly stating our expectations and boundaries for student behaviour is paramount to a self-regulated classroom. We’ve been teaching the Zones of Regulation curriculum to learn strategies for self-regulation. Read how we’re using it in our classrooms here. We use the vocabulary of the Zones, Blue (sad, sick, scared, tired): Green (calm, happy, focused, ready to learn): Yellow (excited, getting carried away, frustrated) and Red (very angry, very frustrated, my body is out of control), as a structure or organizer for our feelings and emotions. At the start of school, and certainly throughout the year, we talk about how we’re feeling, how we interpret the energy (and Zone) of the class and what strategy for up- or down-regulating we should use to bring ourselves back to the Green Zone. An understanding of the Zones is important so that when children are expressing their feelings, they are doing so in a manner appropriate (or inappropriate) to the specific social situation. How and when a child demonstrates his or her feelings and emotions plays a large part of a child’s social awareness. Lately, we’ve been emphasising expected behaviours and unexpected behaviours. “Expected behaviours” are “Behaviours that give people around you good or comfortable thoughts about you” (The Zones of Regulation (2011), p. 14). “Unexpected behaviours” are “Behaviours that give people uncomfortable thoughts about you.” (The Zones of Regulation (2011), p. 14). These definitions are Social Thinking vocabulary developed in Thinking About YOU Thinking About ME (2007) by Michelle Garcia Winner. Even at five- and six- years old, many Kindergarten children are socially aware enough to know they are at school to learn, have fun with their friends and that they will receive the privileges that come with expected behaviour. So right now we’re connecting for our students how expected behaviour or unexpected behaviour can give the other people around you (the other students in the class) comfortable or uncomfortable thoughts. We’re trying to make it explicit for the children how expected behaviours, such as listening to and focusing on the teacher, following the teacher’s instructions, keeping their hands and feet to themselves, walking quietly in line and staying in-bounds during playtime not only make them feel good, but gives the other children in the class “good or comfortable” thoughts about you. When students show expected behaviour, everybody in the class feels happy, calm, and safe – now we’re in the green zone and ready to engage in learning. When a child perceives others to be following the classroom rules and routines, he or she has a sense of security and predictability about the classmates who will be his or her friends. This gives a child confidence and a desire to play with those children he or she feels safe. Conversely, we’re also making it explicit for the children how unexpected behaviours, such as talking during teacher instruction, touching others students in class, racing to be first or budging in line or drawing on another child’s paper gives the other children in the class “uncomfortable thoughts” about you. When a child demonstrates unexpected behaviour, the others students feel scared, uncertain, reluctant, and frankly, many just do not like it. The children become distracted from the lesson, they don’t want to miss the instructions and they are reluctant to play with a child who will not listen to the teacher. For example, when we see unexpected behaviour in class, we observe by saying, “It’s unexpected to see students running down the hall.” Then we teach by saying, “It’s expected that students will walk quietly down the hall.” We do not refer to behaviour as good or bad, but rather expected or unexpected. We know that unstructured time (Centre Time, recess time on the playground, transitions between activities, lining up) is a challenging time for Kindergarten and that’s where we will see unexpected behaviour the most. By establishing classroom routines, we try to make the unstructured time more predictable to reduce unexpected behaviour so that children who are a little bit nervous, worried or anxious know not only what they should do, but what is expected of their classmates. Developing social awareness starts at home during the early years. Although we teach pro-social curriculums such as the The Incredible Flexible You, our focus is on lessons for the individual child in the social context of the classroom such as following “The Group Plan” (as opposed to following your own plan) and keeping your “Body in the Group” (instead of straying from the group). Specific social skills such as maintaining eye contact, personal space and speaking pleasantly to others can and should be introduced, reviewed and reinforced at home. And yes, we still remind our own kids in the high school years about all these values because we as their parents, are their first teachers. We want them to go into the world not just with their leadership skills and academic smarts, but with the social awareness and a strong moral compass so that no matter where they are, they can respond with the respect, empathy and compassion needed today. 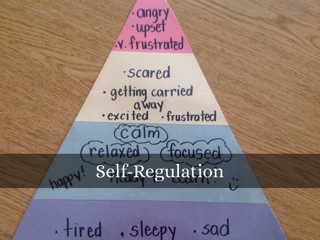 This entry was posted in Self-Regulation by thekinderteam. Bookmark the permalink. That’s so fantastic to build an understanding of self regulation at an early age! Common language within schools has proven to be invaluable when working with mental wellness! !